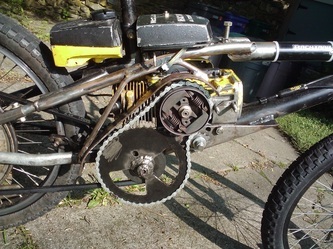 I had an old McCulloch 10-10 chainsaw; the part of the clutch that the chain runs around was chipped, so the chain would not stay on it anymore. Therefore, its use as a chainsaw was compromised. 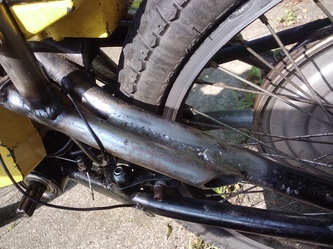 However, it was still a perfectly good working engine and clutch. 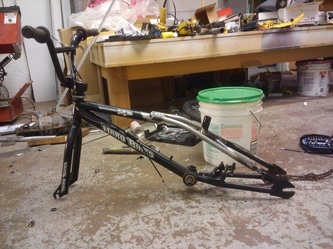 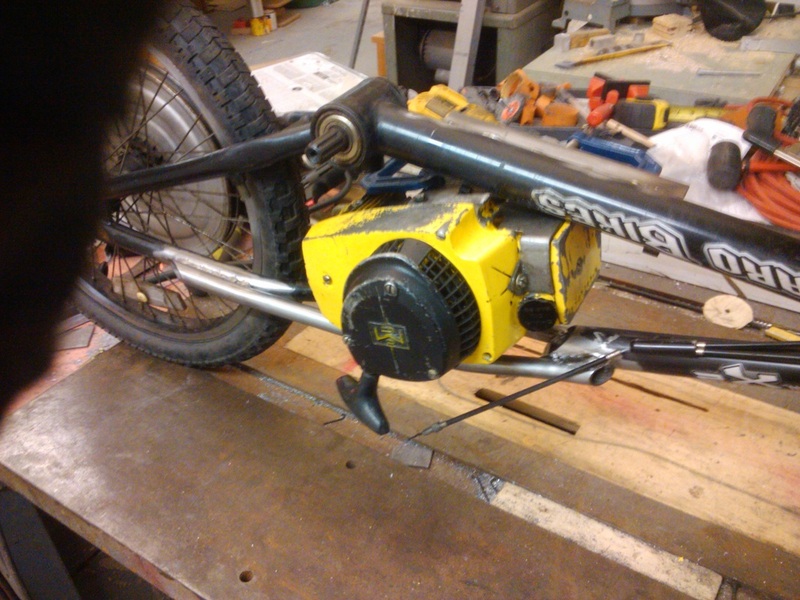 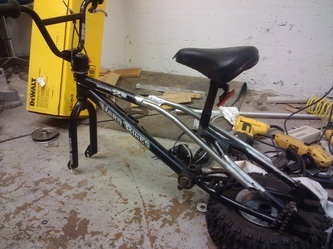 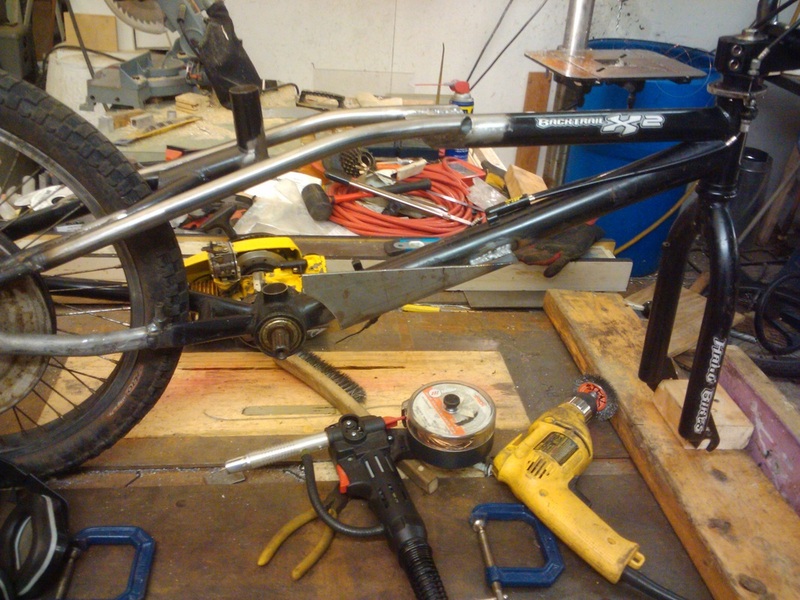 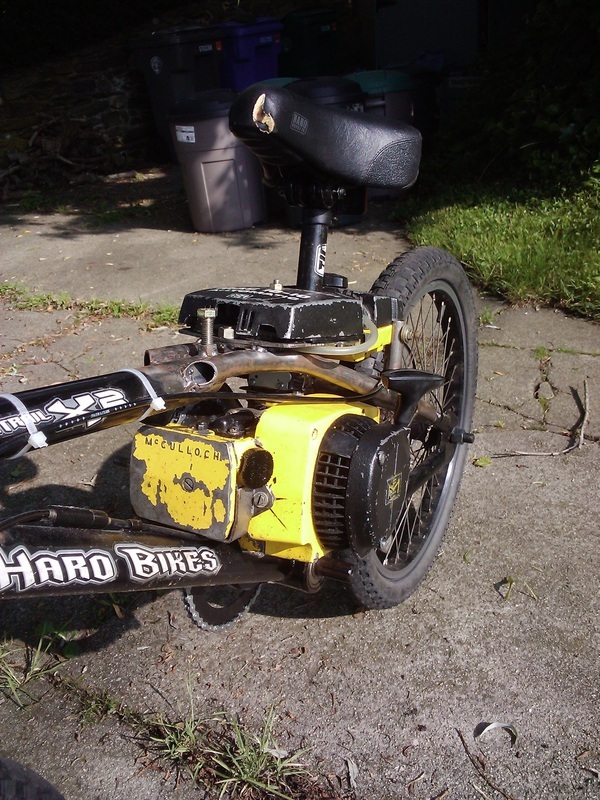 I also had an old Harro BMX bike that was too small for me to use anymore, and I liked it too much to sell it. I decided I would mate the two of them and make a chainsaw mini-motorbike. 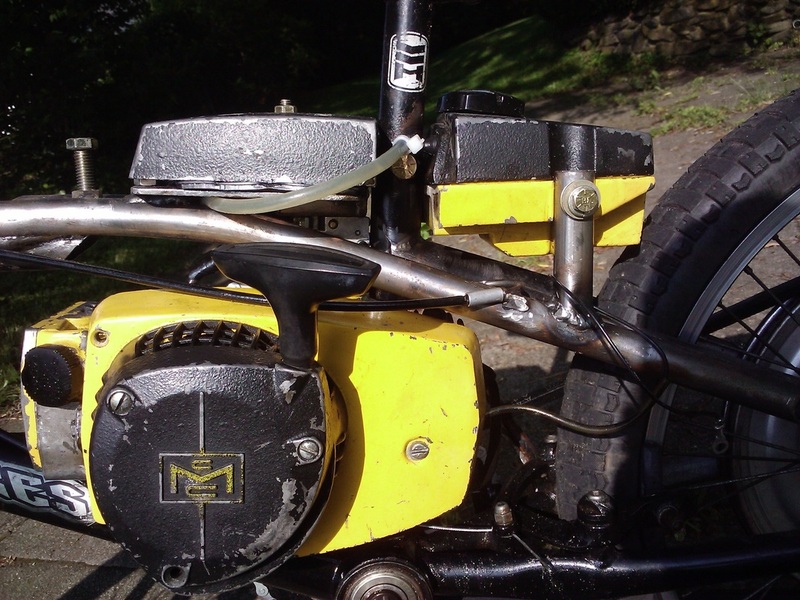 I wanted to preserve as much of the original bike as possible along with preserving the original McCulloch components and designed the motorbike based off of these principles. My plan was to cut away some of the paneling from the engine and mount it in the open space in the frame, but it would not fit. 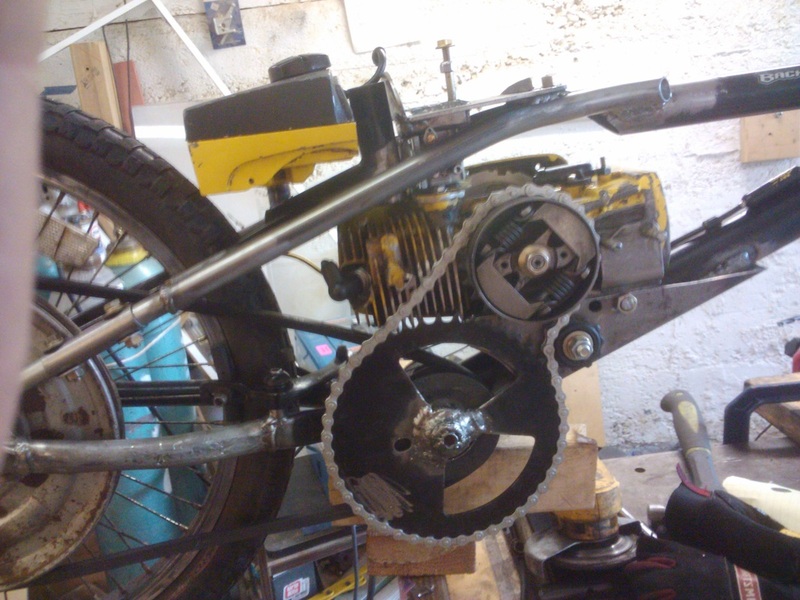 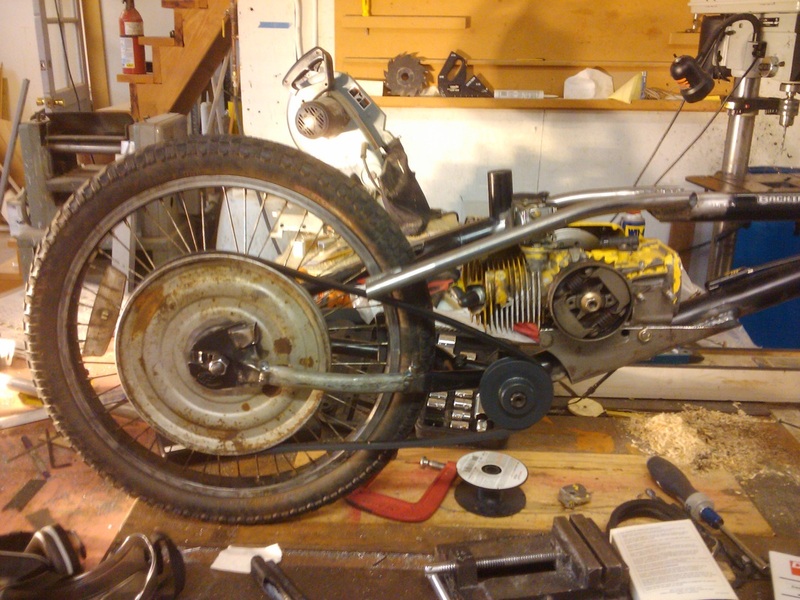 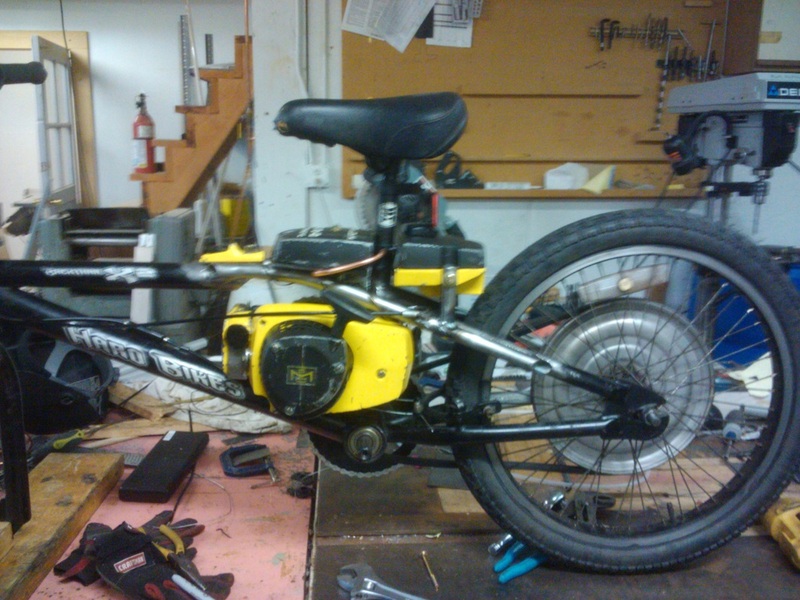 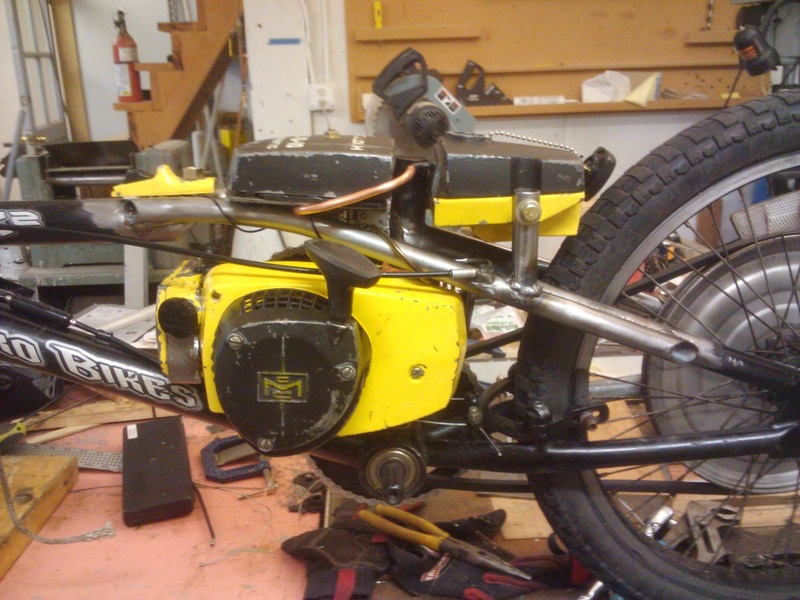 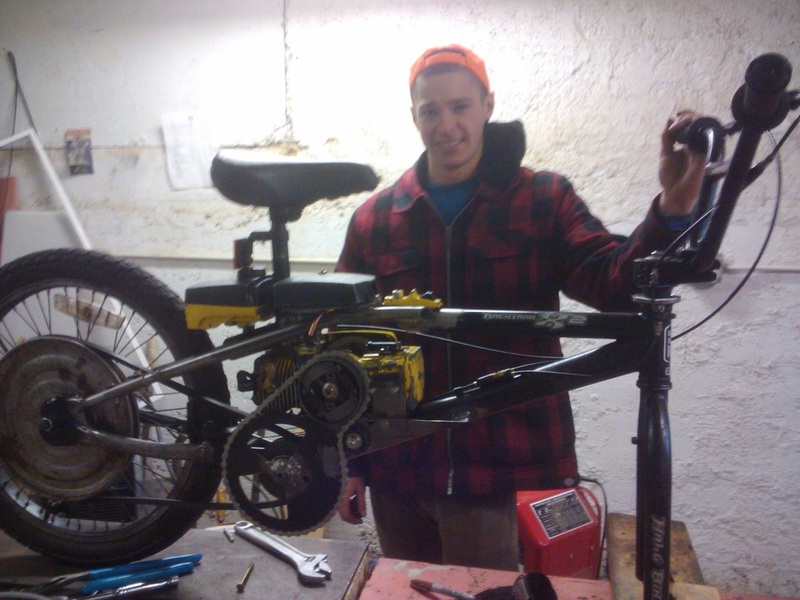 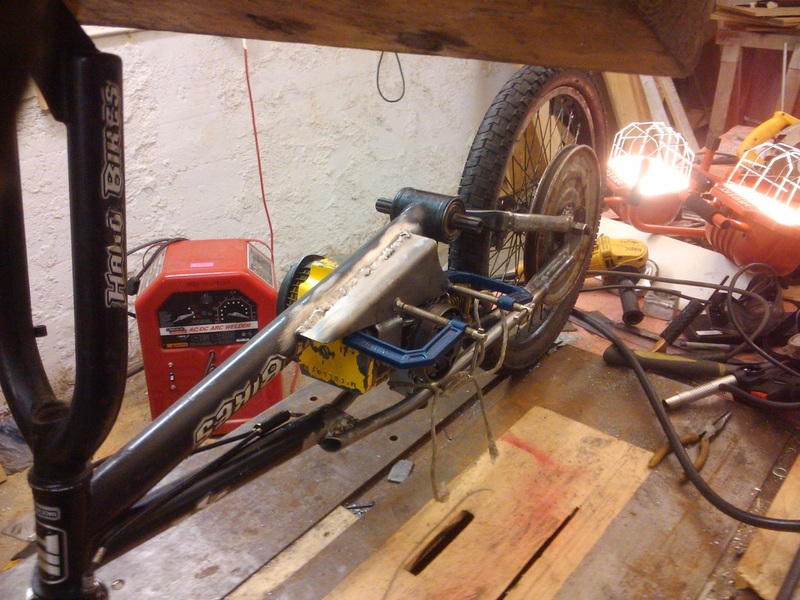 I then decided to remove the carburetor, air filter and gas tank and mount them above the frame below the seat. 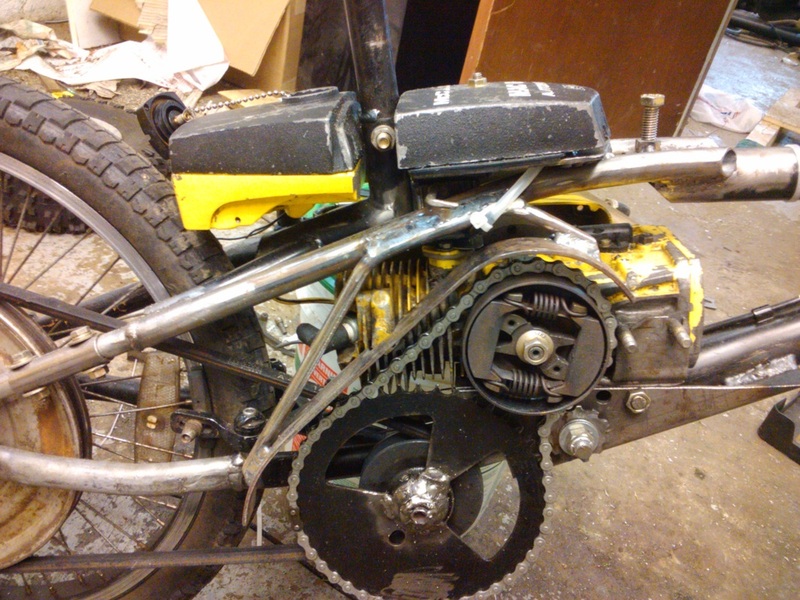 There was a problem with this too: the carburetor needed to be on the engine somehow, and there was no way to properly fit it in the frame with the engine because the bike frame was in the way. 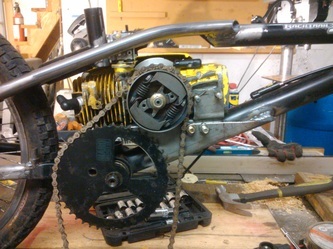 I decided to cut a section of the frame away, allowing the carburetor to stick up through. 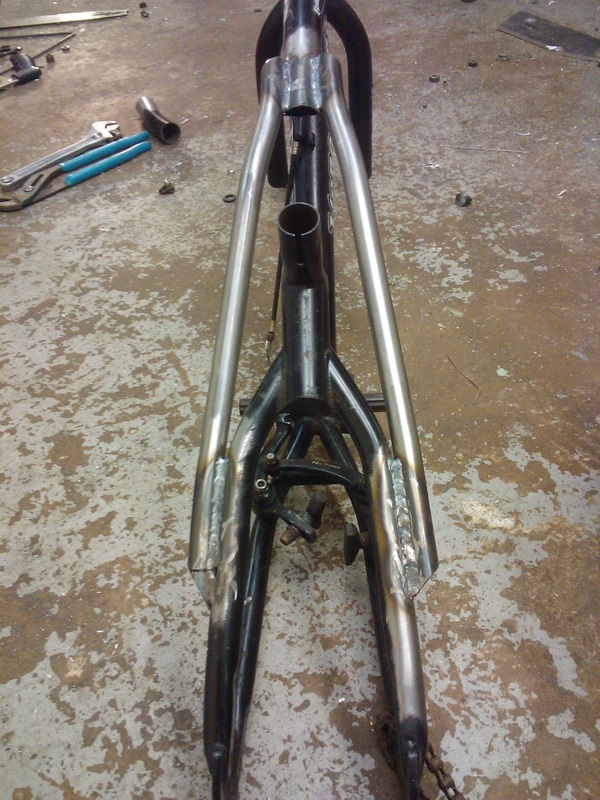 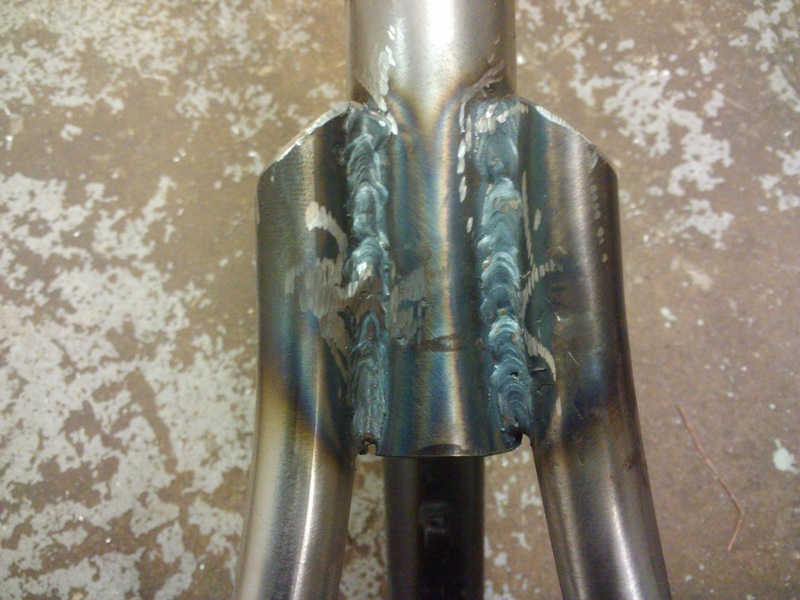 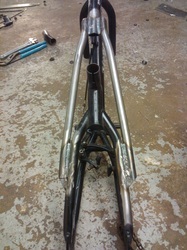 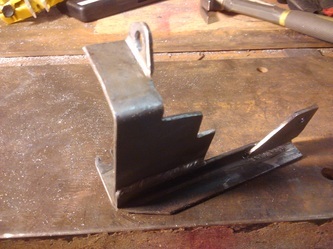 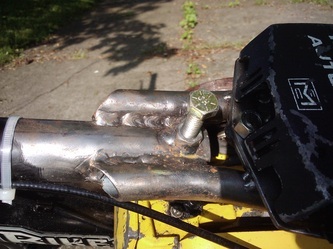 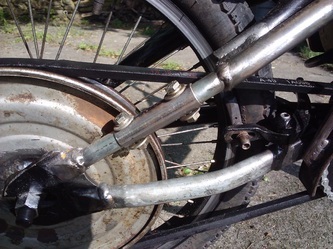 Then I bent and welded smaller pipes on either side to connect the frame back together so that it would still be structurally sufficient. Normally, the air filter would have housed the carburetor, but the air filter was too wide to fit in the frame with the carburetor, so I modified it and mounted it on top of the carburetor and frame. I mounted the gas tank behind the seat to make the whole thing look nice, showing off the original look. 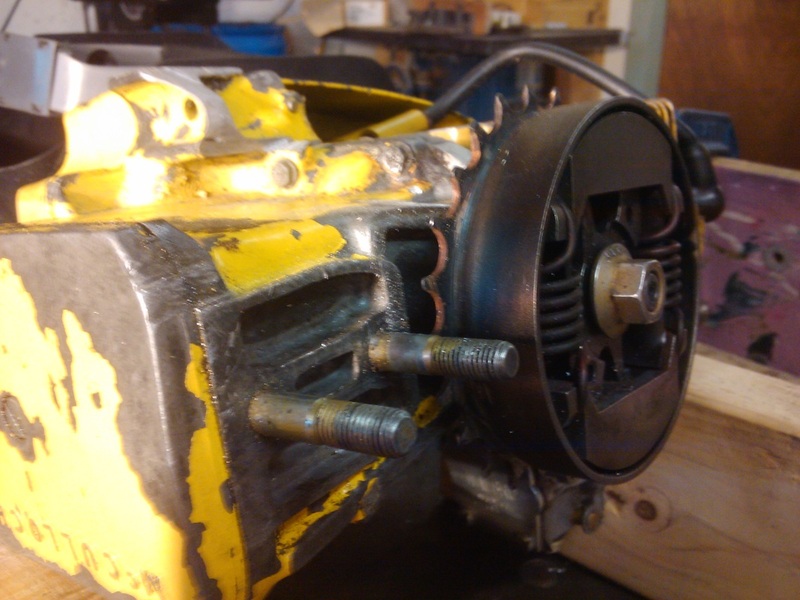 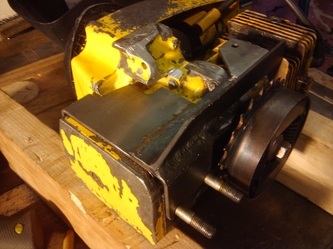 ,The rpm’s of a chainsaw are very high so the engine would need to be geared down; I calculated the ratio and found sprockets and pulleys accordingly. 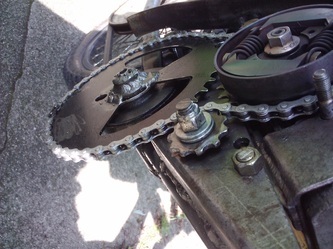 There was no way to use the existing chainsaw sprocket to attach a chain to because it was chipped, and bicycle chain is very different from chainsaw chain. I decided it was best to weld a small bike sprocket to the centrifugal clutch. 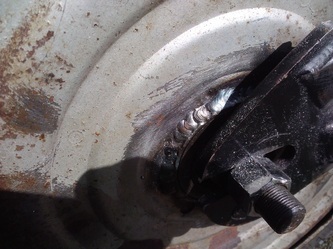 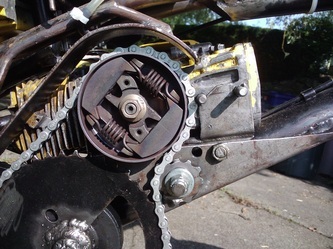 The way I geared down the engine was through a double gear reduction, first with a chain and then with a belt (because I could only find a pulley large enough to achieve the proper gear reduction). With the chain spinning so fast, a chain guard was mandatory. 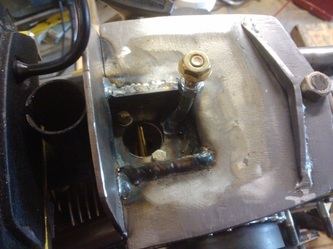 I bent one out of rod- and sheet-metal and welded it to the frame (ensuring that the engine could still be removed once it was welded). The throttle was the finishing touch. I used a bicycle left-hand brake lever, and brake cable for my throttle lever, and ran the cable back to the carburetor where I hooked it on. 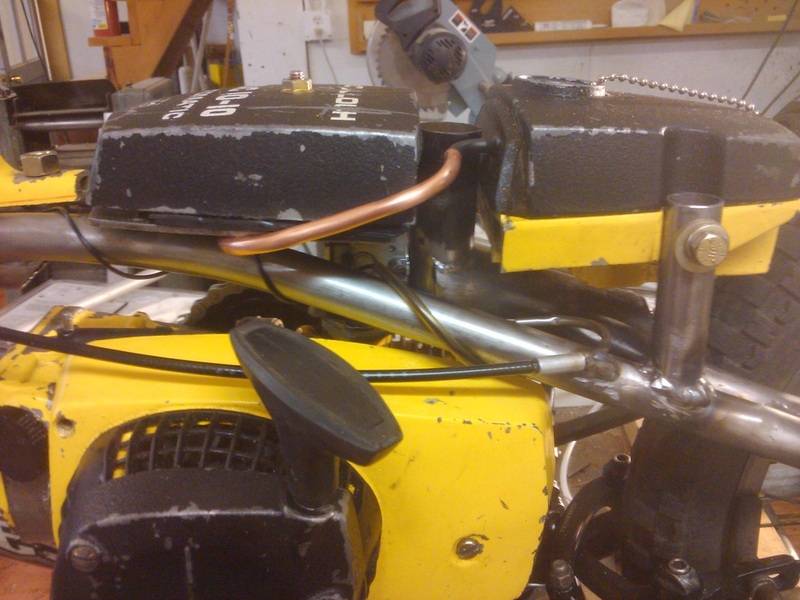 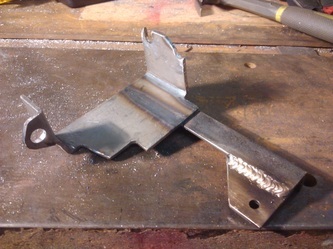 In addition to the throttle cable, I also had to weld on a small twist lever for the choke and the kill switch.